Have you ever received an email notification that someone was following you on Twitter, so you clicked on the link to find out who they are, only to have it bring you to this screen below? YIKES! At this point I would normally just close the window and move on, but today was different. Today, the wise old “Twitter Owl” grabbed my attention causing me to investigate further. I’m glad I did, this was worth it. If you haven’t seen this before, and you’re on Twitter, you will eventually. 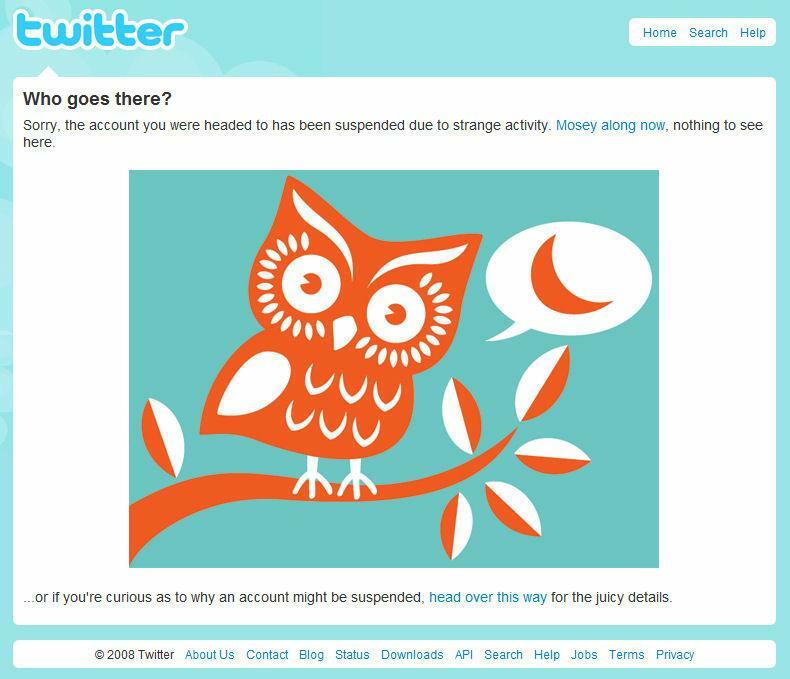 I noticed the sentence at the top that reads, “Sorry, the account you were headed to has been suspended due to strange activity. Mosey along now, nothing to see here.” HUH? I felt like a school child having my hand slapped. Have you ever clicked on the “Mosey Along Now” link? I did and had to laugh. It was like kicking my heels together twice and there I was. Then I decided to read a bit further and noticed this, “…or if you’re curious as to why an account might be suspended, head over this way for the juicy details.” What the Heck? How could you not click on it when they put it that way? Here’s what I found out about Twitter today. Just like many of you, I don’t read the terms and service on many of these social networking sites, we just join and start clicking away. It’s like installing software, who really reads that stuff anyway, you just click the “I agree” box and go. Well 1800 followed, 1458 followers, and 830 twitter updates later, here I am, finally reading their terms. You have to be laughing inside right about now… I hope I’m not the only person that has ever done this. Check this out, you can get suspended on Twitter if you do ANY OF THESE 5 THINGS and get caught. I guess every good tweet gets the birdie, but if you’re a bad tweeter, you’re gonna get the owl! So while on this subject, (since I know you’ll be clicking on that link above… haha), you might want to take a minute and check out the terms of service here on ActiveRain too. Ours are a bit different than Twitter, but I’ll let you be the one to decide if playing by the rules is worth it or not. Every Social Network you’re on including ActiveRain has to suspend members from time to time. We should all try to make it a point to read and honor ALL Social Networks terms, rules, and guidelines, it’s really no different than being in someone else’s home or neighborhood. The funny thing is, more people have probably watched this “Twitter In Plain English” video, than actually read their terms of service.